Tens of thousands of army reservists are waiting for orders to move into Gaza. A poll shows 84% of Israelis support Pillar of Defense. Tens of thousands of army reservists are waiting for orders to move into Gaza. A poll shows 84% of Israelis support Pillar of Defense. A ground incursion apparently awaits the outcome of efforts for a truce. A Dialogue survey carried out for the Haaretz newspaper revealed that 39% of respondents support a continuation of aerial attacks and 30% want a ground offensive. Only 19%% said they want a quick ceasefire. More than half of the respondents are satisfied with the performance of both Prime Minister Binyamin Netanyahu and Defense Minister Ehud Barak in the week-old counterterrorist campaign. The country has mobilized to come to the aid of reservists, many of whom were called up after the Sabbath began last Friday night, recalling a similar situation at the start of the Yom Kippur War in 1973. Jewish law not only allows but also requires taking actions that normally are prohibited on the Sabbath in order to save lives. Several reservists, including fathers with several children, were told before the Sabbath to carry their cell phones in the case of a call-up, which was issued after the Sabbath began. Many synagogues began to empty as reservists rushed home to gather essentials before traveling, sometime taking their own cars. On-duty soldiers called their families to send supplies to friends who were stranded. One reservist from Ashkelon told Arutz Sheva that the parents of “a friend of a friend” surprised him with a personal visit adjacent to the community and gave him sheets, blankets and snacks. 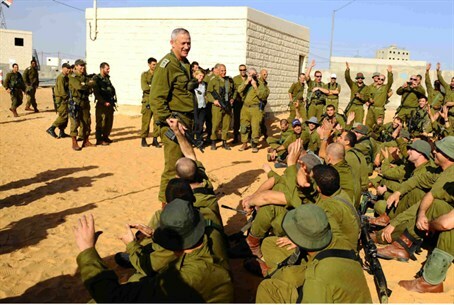 Many reservists replaced regular soldiers on patrols to free them for action in Gaza, if the IDF gives the go-ahead. Dozens of armored vehicles and tanks were seen on transports from the Golan Heights, along the Syrian border, to Gaza. Thousands of reservists swarmed into convenience stores on the way to their bases to stock up on goods.